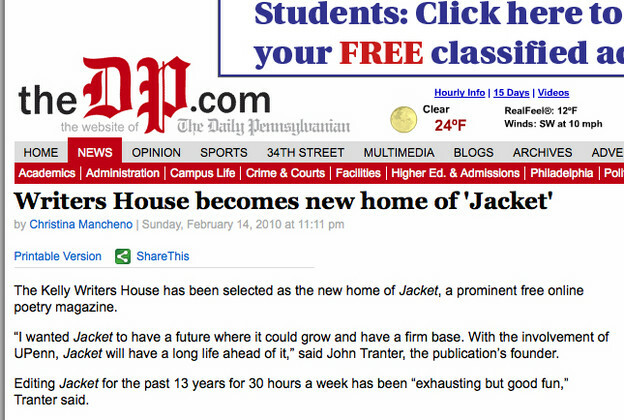 Screenshot of article about Jacket2 in the "Daily Pennsylvanian"
“[John] Tranter broke new ground in terms of serious criticism of poetry being spread all over the world,” [new editor Mike] Hennessey said. Media Editor Steve McLauglin, a 2008 [Univ. of Pennsylvania] alumnus, is going on a two month bus trip this summer with his audio recorder to record poetry readings from all across the United States to use as podcasts for Jacket2. “This project is an example of the kind of thing that doesn’t happen very often. Off-the-wall stuff happens at the Writers House,” McLaughlin said. “Jacket is one of the most appealing and best edited of literary magazines that exists,” Bernstein said.